It might seem counterintuitive, but when trying to examine the bottom of Lake Huron, researchers discovered it is helpful to take a look from space. 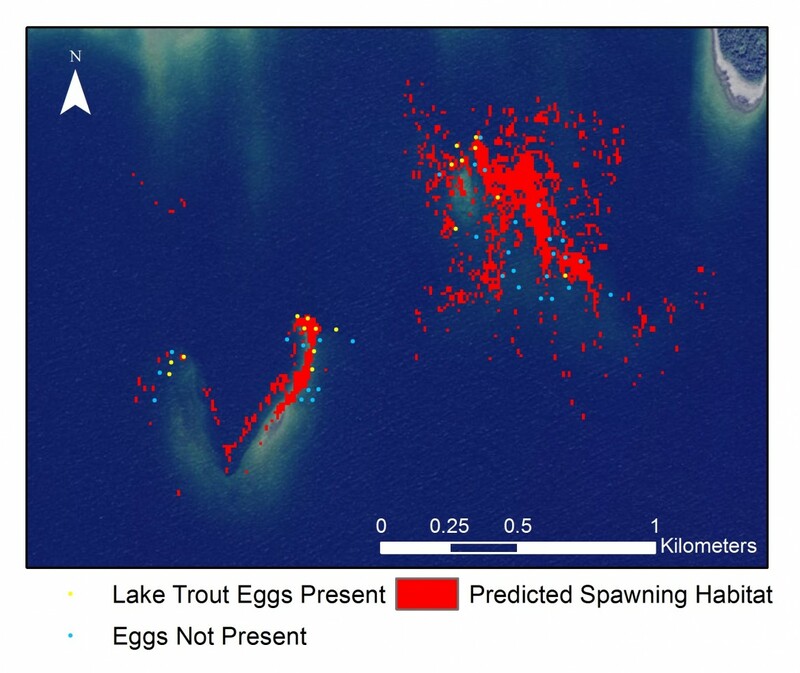 Satellite imagery offers a new tool for identifying nearshore lake trout spawning habitat across broad areas of the Great Lakes, according to a recent study in the Journal of Great Lakes Research. Researchers have been using satellite imagery to look at how the distribution of lake-floor algae in the Great Lakes is changing, said Amanda Grimm, lead author of the study and an assistant research scientist at Michigan Tech Research Institute. While studying lake trout rehabilitation in the Drummond Island Refuge in northern Lake Huron, U.S. Geological Survey researchers noticed that the stony reefs where they found naturally reproducing lake trout laying eggs were cleaner of algae than surrounding areas, Grimm said. They realized the difference might be seen from satellite, which would help select good lake trout spawning grounds. Satellites scan broad geographic ranges, said Tom Binder, a senior researcher with the Geological Survey and a coauthor of the study. They help avoid labor-intensive searches with divers and underwater cameras. It does that by analyzing how much light is reflected from the lake bottom. The study began after a project that looked at the physical variables within Drummond Island spawning sites, Grimm said. 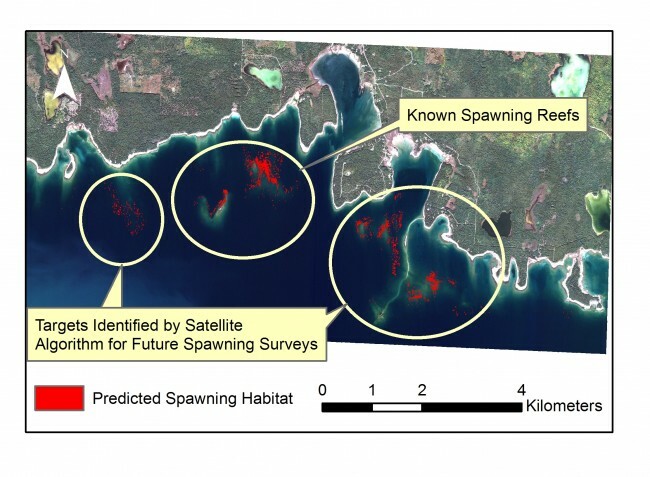 The researchers already knew where spawning was occurring, allowing them to test the satellite imagery against it. The idea was to confirm that the density of algae indicates higher-quality spawning grounds. There are limits. Satellites can only see so far into the water and trout spawn in deeper waters. But since Lake Huron is so clear, the researchers can see the lake bottom to about 40 feet deep, she said. And it’s just a first step. “It tells you where the probability (of finding spawning sites) is the highest,” Binder said. Understanding lake trout spawning habitat long-term could inform ways to improve or evaluate hatchery practices, Farha said. The combination of overfishing and deaths from sea lamprey led to the collapse of lake trout in all the Great Lakes in the 1950s, he said. The Great Lakes Fishery Commission started lake trout restoration in the 1960s, and it is now one of the largest predator recovery endeavors in all of North America. Sea lamprey are invasive parasites that latch on to fish with a suction cup-like mouth and live off of their blood. Considering the money and effort that’s gone into stocking lake trout for more than 50 years, anything to maximize the probability of bringing the fish back is worthwhile, he said. Binder said it’s uncertain whether hatchery fish are any good at reproducing in the wild. If the researchers can determine where spawning sites are, they can study the spawning behavior, he said. “You could imagine that the wild-spawned fish are better at finding the best substrate than hatchery fish are,” Farha said. The satellite technique could ease the work building artificial reefs, he said. “If we know more about what lake trout use to select habitat, we can build those reefs to suit their needs a little better,” he said. The researchers are unsure why lake trout spawning grounds are cleaner than the surrounding areas. The lake trout’s preference of cleaner, algae-free spawning sites is key to relying on the satellite imagery, Binder said. It is as yet unclear if the approach is applicable to other species. I live on Cream City Point Drummond Island, since you didn’t show the whole Island on the South Shore, I am curious as to where the Fish are in location to my property. I live on the point on the shore of Lk Huron.